Total weight approx. 2 kgs./4.4 lbs. chest sizes up to 46"
waist lines up to 42"
up to 2” openings under the arms. Copy of a Greek muscle armour in original size.This style of armour was used in Greece, several were found in warriors' graves, so we know pretty well how they looked and how they were made.Our reproduction is based on the 2 parts of armour (breast plate and back plate) found at such a grave site. It is handcrafted from brown cowhide. Total weight abt. 2 kgs./4.4 lbs. 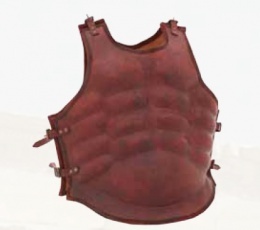 It fits chest sizes up to 46", and waist lines up to 42".Adjustable leather straps allow a chest size of up to 50”, leaving up to 2” openings under the arms. This page was last modified on 23 April 2014, at 19:54.